Remi and Sam Fargo visit the Pebble Beach Concours D’Elegance antique auto show where they notice a young man near Sam’s age taking particular attention to them. It turns out that Sam and Oliver are distant cousins and Oliver is from a noble line in England. They soon discover that in addition to the love of antique automobiles Oliver and his grandfather Albert are in need of help.Help could come in the form of a loan, but that sort of help does not solve a mystery. Soon they find themselves embroiled in an adventure that is as deadly as it is exciting. I love the way they interweave another Clive Cussler character, Issac Bell, into the story. This leads not only to an exciting adventure for Remi and Sam, it also provides a mini adventure for Issac Bell. 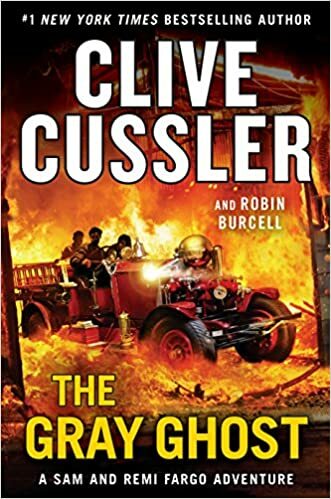 You won’t be disappointed with “The Gray Ghost” a must read for all Clive Cussler and Robin Burcell fans. This novel keeps you interested from start to finish. The crisis that the Fargo’s find themselves overcoming are somewhat realistic and it’s fun to follow $ figure out what’s coming next. With the exception of The Fargo Adventures and The Oregon Files the rest of Cussler’s novels have become two characters constantly fighting their way out impossible situations-something that I have gotten tired of! Looking forward to more Fargo Adventure and Oregon File books being released.